Life at the Vicarage proceeds towards the summer Festival apace. This year is the Lindisfarne Gospels as they come up as far as Durham and we have all become experts on the subject. I’m not sure if I will be dressing like an Anglo Saxon but I will be having a go at the calligraphy. I will probably be sat reading at least one book in the Marquee in the garden… for more details have a look at the church website at http://www.pontelandstmary.co.uk which has many photos and other information about what goes on hereabouts. 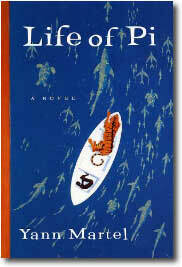 Our two Bookworms meetings have been looking at Life of Pi by Yann Martel. It was generally well received, with some interesting questions being raised. We were very impressed by the idea of Pi being interested in Christianity, Islam and Hinduism, and the way that the flat mentioned in the first section still has the symbols of all three faiths. We had the predictable discussion about the two stories of what followed the sinking of the ship, and what each version had to say to the reader. I think we generally preferred the tiger version! This book was an ideal bookgroup choice, as many had read it, and I read it during a day. (Mind you we did have a powercut!) While there were bits that were disturbing, essentially we found it at easy book to read, though with a fascinating narrative and some really interesting descriptions. My geography is so bad that I was unsure about where all this took place and if one or two features could be true. It is such a detailed, warmly written book that some of us really wondered if it could have happened. This is a book of many elements, including the questions that a teenager would ask, the way he thinks and reacts given his knowledge of animals and their behaviour. The tiger is seen as beautiful, though threatening, an intelligent being but still a wild animal. I found it a bit difficult to envisage the way the boat and raft worked, and very few of us had seen the film. Maybe I’ll get the dvd and find out how they have filmed it!